Tarnation, the autobiographical first feature from director Jonathan Caouette, through digital editing techniques and a bit of perspective, tries to elevate the home movie to the level of art. Cobbled together from a seemingly endless supply of personally shot footage, the finished product uses techniques like dissolves and split screens until the oversaturated, conventionally “bad” video photography becomes a ghostly virtue. The multitude of video techniques and low budget feel that’s employed almost makes the experience of watching it feel like a collective memory, hewn together from the shreds of all the home movies we’ve relegated to a forgotten closet. 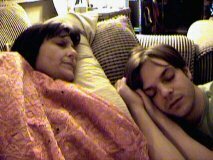 Picking up in March 2002, Tarnation begins as we see Jonathan dealing with news of his mother’s apparent lithium overdose. One of the first scenes shows Caouette filming himself with a video camera, even though he has a fever and is clearly stressed out by mother’s condition. Soon, it becomes apparent that this kind of exhibitionism is a form of self-preservation for the director. 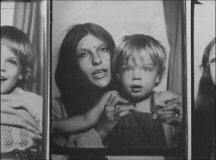 When he returns home to his mother, his memories of his Texas upbringing are unleashed, taking the form of an avant-garde montage of photos and video scraps, organized by a series of detached, unspoken intertitles that refer to Jonathan in the third person and recap the tragedies of his formative years, helping to explain the development of his current personality. Music guides these early flashback sequences, but they remain a bit inelegant, even if I can’t quite say that I’ve seen this exact approach used before. Stylistically, the barrage feels akin to watching an epileptic fit, though the experience becomes more explicitly defined when it’s made clear that Caouette suffers from a depersonalization disorder (characterized by the feeling that your own life is a dream – that you’re “watching yourself live from the outside”). The unfortunate details of Caouette’s childhood pack a collective wallop. The son of Renee, a former child model who was paralyzed and then subjected to an unending series of shock therapies (we’re told she’s been in hospitals for treatment over 100 times), Jonathan clearly has his share of emotional baggage. Footage such as that of Jonathan at age 11, already admittedly gay, imitating an abused woman while telling a sordid tale of drug use and physical abuse, is fairly shocking and morbidly fascinating. Clearly filming himself to provide himself with a therapeutic outlet, Jonathan’s record of his blistering young psyche recalls the series of uncomfortably close home movies that dotted last year’s Capturing the Friedmans. It has to be said, though, that Tarnation, as opposed to Friedmans, genuinely feels like an extended therapy session (the latter seemed a ghastly exhibition of pain). Perhaps inevitably, the combined effect of the series of tragedies we witness makes these scenes feel like a cry for audience sympathy. When he includes the fact that he had his brain warped by smoking a joint laced with PCP and formaldehyde or the revelation that he watched as his mother was raped, it feels like he’s still assigning blame. While no one can deny that Caouette’s youth was troubled, a compendium of his real-life horrors doesn’t automatically make for compelling drama. Indeed, it’s much more interesting to watch Jonathan as he begins to define himself despite his circumstances than it is to watch as he wallows in his past. The scenes of self-discovery that recount Jonathan’s first trip to a gay bar (at age 13, disguised as a Goth girl) or show his budding interest in cinema are perhaps the most emotionally involving of Tarnation. Watching the moments in which Jonathan films his own Super 8 exploitation movies (sample title: Spit and Blood Boys) with the help of his grandma, finds his first boyfriend at age 15 (you get the sense that he has far more affection for Michael, and later boyfriend David than he does for his mother), or finally moves to New York City, one is aware of a kind of hope the belies the movie’s title. For all of the inherent drama in his story, Jonathan still comes off like a drama queen in the retelling of it, and that involvement undercuts the stylistic approach’s approximation of his depersonalization disorder, somewhat. Objective perspective can’t be (and honestly shouldn’t be) kept here from the people that Caouette loves or himself, and lack of objectivity amplifies the events of his life, while the style is trying to remind us just how detached he is. Two-thirds of the way through its runtime, with Caouette firmly established in New York, Tarnation finally leaves expository stage and begins to gain some momentum as a story. Jonathan, desperate for answers from his mom and grandfather about their past, becomes more confrontational. They mostly respond to his questions with hostility (“We don’t need it on film”, his mother says at one point, while Jonathan keeps rolling. ), but their attitudes seem to suggest most of his hunches are right. One could complain that Jonathan is perhaps a bit too eager to demonstrate his personal resilience (does he largely neglect the role played by social services in his development because they had little effect or because he had little footage of them? ), but after considering his circumstances, it’s a miracle that he’s not even more unreliable in narrating his own tale. This is not a film in which concrete resolutions are reached and catharses are easily attained, and as such it properly reflects at least one truism in our lives. It’s all the more unfortunate, then, that the final bathroom confessional and subsequent scene of him tucking in his mother feel like artificial attempts to provide closure on a life that is still very much in progress.